Explore the world of animals and their habitats in this bumper activity book. Children can colour exotic scenes including an arid desert, a grassy African plain and a lush rainforest. Backgrounds are already filled in to allow children to concentrate on the fun details. 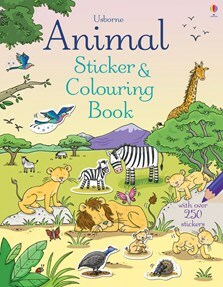 Animals to colour include lions, tigers, zebra, giraffes, snakes and alligators, as well as more familiar farmyard animals. With over 250 stickers of animals, plants and more.